The tangy zest of a caipirinha and the spirited capoeira ritual await you in Brazil. From the Amazon's rain forests to the exotic beaches of Bahia, this is a dream vacation destination. Tudo tranquilo! 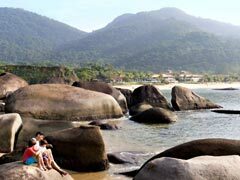 At Rio Das Pedras in Brazil, discover Brazil's second largest nature reserve. 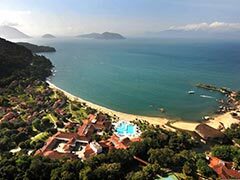 This Brazilian Resort is beautifully located in the Mata Atlantica nature reserve, between the forest and a fine sandy beach. The Club Med Resort puts the focus firmly on ecology, and offers a good range of land and water sports in the heart of nature. Discover La Réserve, the 5Ψ Luxury Space at the 4Ψ Rio Das Pedras Resort. The 5 Trident Space is ideal for adults looking for privacy, customised services and premium comfort, without sacrificing the warm and friendly spirit for which Club Med is renowned. This typical restaurant, with semi-open architecture, is located near the river that runs through the Resort. 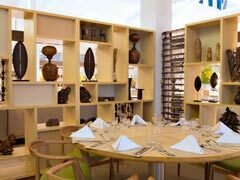 It serves late breakfast and lunch, as well as Brazilian speciality dishes in the evening, with waiter service. Evening tables must be booked in advance at Reception. The restaurant may be closed at certain times of the year. An ideal environment for combining wellness and tropical adventure. In the heart of Mata Atlantica, the Resort has 346 rooms divided between several neo-colonial-style Solares (groups of buildings). Discover a new 5Ψ Exclusive Space, "La Réserve", with 33 comfortable and elegant Suites, in three 4-storey buildings with lift. 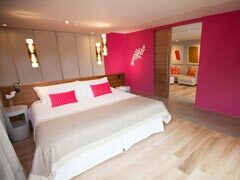 The essential Club Med experience with a good standard of comfort and facilities. Facing the gardens or sea, the Club Room ensures you of peace and tranquility, for a family holiday or for couples. The privilege of space and comfort with dedicated services and a great location in the Resort. 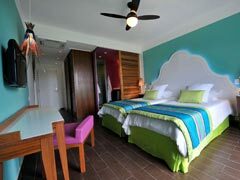 The Deluxe Room is elegant and contemporary, with a touch of the exotic mix that makes the charm of Brazil. Ideally located by the sea, indulge in the unique experience of a comfortable Suite in the 5Ψ Luxury Space, "La Réserve", with customised services and exclusive access to the adults-only 5Ψ lounge bar and pool. Exploring the wonders of the most fabulous and diverse tropical forest in the world. Holidaying in a neocolonial style Resort, and enjoying the tranquility of its quiet pool. Waterskiing or wakeboarding in a sheltered creek. Staying in a Family Suite in the new 5 Trident Luxury Space with its dedicated pool and lounge bar. With the benefit of over 40 years’ Club Med experience behind it, our Resort proposes innovative clubs for children and teenagers: Dedicated areas specifically designed for their needs, and equipment designed with a view to comfort and safety. Design inspired by the local environment with its flora and fauna, the Petit Club Med® at Rio das Pedras introduces children to the pleasures of living in harmony with nature, and satisfies their curiosity. Between sea and tropical forest, on the edge of a protected nature reserve, a fun space in harmony with luxuriant nature welcomes children from 2 to 3 years old. G.O®s with a passion for their job. Numerous activities for all ages: sport, creative activities and games for the different age groups. Opening hours that allow parents to make the most of their stay, and respect the children’s desires and sleeping patterns. For information: the children’s clubs are open all week, except Sunday. In France, G.O®s with a BAFA (State diploma for youth group leaders) or childcare qualification, depending on the age of the children; in other countries, an equivalent local diploma or relevant experience. Age-specific clubs: Petit Club Med® (2 to 3 years) (extra charge), Mini Club Med® (4 to 10 years) (included), Junior Club Med (11 to 17 years) (included). 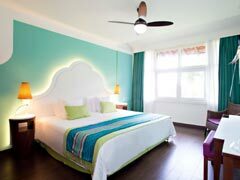 Hotel amenities and facilities for kids: BABYSITTING From 4 months to 7 years (extra charge), CLUB MED BABY WELCOME® (FROM BIRTH TO 23 MONTHS) Until 23 months, BABY CORNER From 4 to 23 months, BABY FEEDING AND EQUIPMENT ROOM Until 23 months. Activities for kids: PETIT CHEF PROGRAM From 2 to 10 years, LITTLE TENNIS From 3 to 4 years, LITTLE SOCCER From 3 to 7 years. Activities Service included: Archery School, Fitness School, Tennis School, Waterskiing & Wakeboarding School. Activities Sports included: Basketball, Beach, volleyball, Football, Handball, Table, tennis, Volleyball, Aquafitness, Tennis, Minifootball, Fitness, walking, Cardio and weights room, Kayaking, Beach, tennis, Slackline.